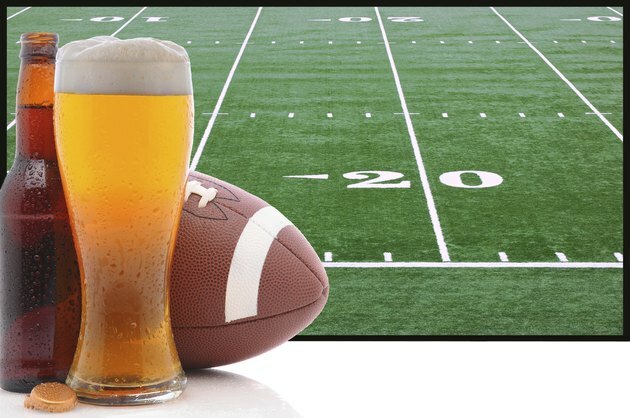 Observers and participants alike frequently consume beer during and after sporting events. In fact, beer is sometimes more readily available than water, providing thirsty athletes with a much-desired source of fluids. However, athletes and observers should both exercise discretion when consuming alcoholic beverages. Getting drunk impairs judgment and reaction time, also increasing your risk of injury, according to the Centers for Disease Control and Prevention, or CDC. Drinking beer may also contribute to muscle cramps. A muscle cramp happens when a muscle involuntarily tightens or spasms, causing sudden acute pain. Otherwise known as a charley horse, a muscle cramp often occurs during exercise but can also occur while you're sleeping. According to MayoClinic.com, muscle cramps usually go away on their own without medical treatment. If you experience recurring muscle cramps, check with a doctor to make sure they aren't an indication of a more serious underlying medical condition. Muscle damage, possibly due to a heavy training schedule, may increase your risk of muscle cramps during an athletic event, according to a study reported in the March 2011 issue of the "British Journal of Sports Medicine." Increased exercise intensity or previous episodes of muscle cramping also appear to predispose athletes to exercise-induced muscle cramps, says research presented in the June 2011 issue of the same journal. This study concludes that dehydration and electrolyte imbalances don't cause exercise-related muscle cramping. Drinking 1 g of alcohol per kg of body weight after strenuous exercise amplifies the loss of power associated with exercise-induced muscle damage, says a study published in the March 2010 issue of the "European Journal of Applied Physiology." A standard 12-ounce beer contains 13.7 g of alcohol, according to the CDC. For a 150-lb./68-kg man, this means that consuming five or more beers after a workout will cause a significant decline in muscular performance and recovery. However, drinking .5 g of alcohol per kg of body weight after strenuous exercise does not negatively impact muscular performance or recovery, reports a study in the same journal's April 2011 issue. Following a proper athletic training program can lessen the probability of exercise-related muscle cramps, says an article published in the July 2007 issue of the "Journal of the American Academy of Orthopaedic Surgeons." Since drinking 1 g of alcohol per kg of body weight after working out exacerbates exercise-induced muscle damage, and since prior muscle damage appears to predispose athletes to muscle cramps, it follows that limiting your beer consumption after exercising may help reduce your risk of muscle cramps.